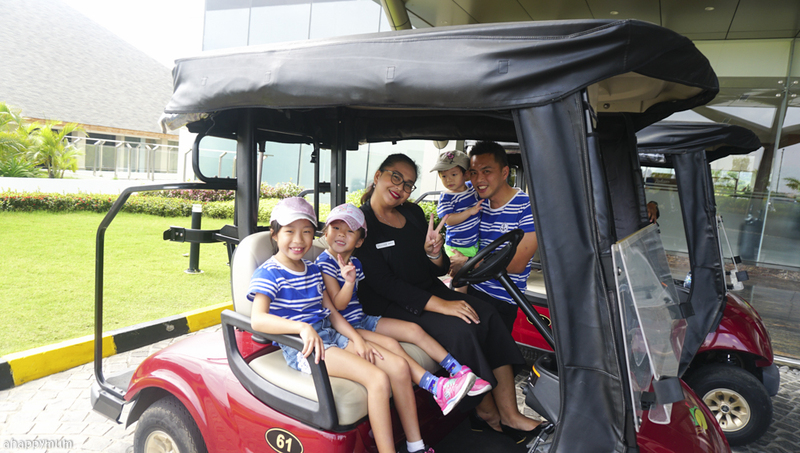 Remember I shared with you all about Radisson Golf & Convention Centre last year and how it makes for a luxurious yet family-friendly getaway? If you missed it, you can read all about it here. That post became one of the most popular travel posts on the blog and I'm so glad I managed to share all about this fun-filled haven which is just a one-hour ferry ride away. At the end of last year, we were deeply honoured to be invited back to Radisson for a second visit. I mean, if I were the client, I would probably want to get different bloggers every time so that they can cover different perspectives and reach out to a wider mass. To be able to receive multiple invites from places like Club Med, HARRIS, LEGOLAND and now Radisson, it validates what I do and makes me feel assured that my work on the blog is being valued. So, thank you very much for motivating me to keep writing. 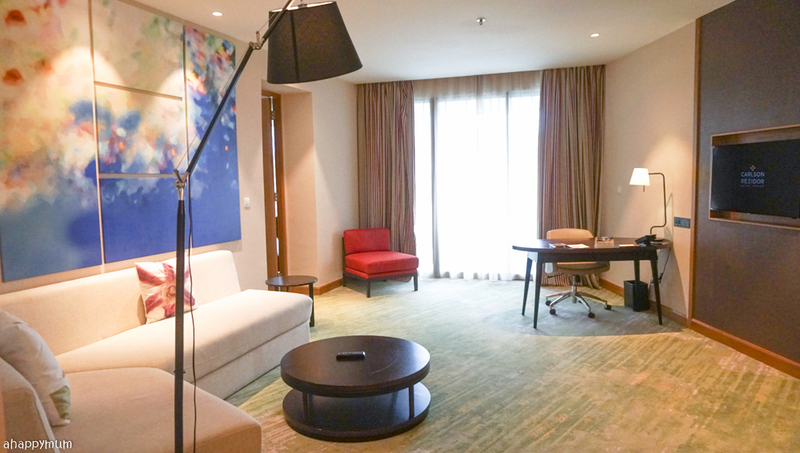 In this post, I will be sharing with you more about the revamps at Radisson and how it is now more family-friendly than ever. My kids enjoyed themselves tremendously at our last visit and even up till now, they still talk about it from time to time and wish that they can go back again. 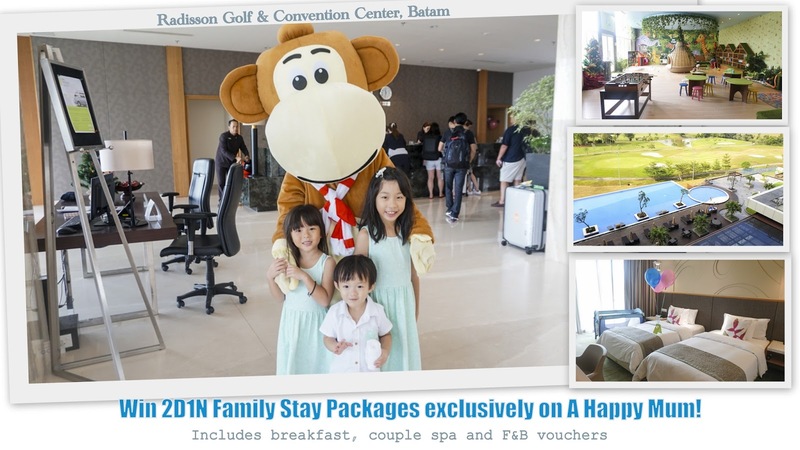 What's more, once again, I will be hosting an exclusive giveaway and two of you will win a 2D1N family stay in Radisson Batam - which includes breakfast, spa sessions and dining vouchers too! Read on to find out more. The first time we came, we were awestruck by the grandeur of the hotel lobby which came complete with gorgeous hanging pendant lights and golden swirls. This time, we still felt very much welcome, thanks to the friendly staff and cosy reception lounge. 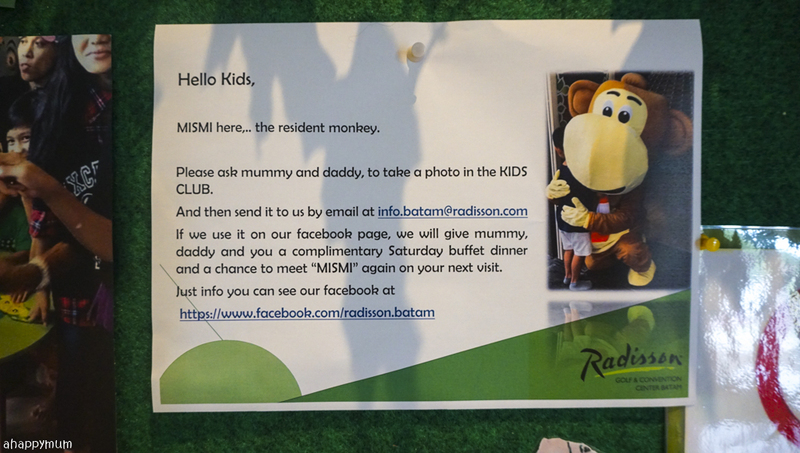 To make it even better, we were greeted by a very adorable monkey called Mismi, who is now the mascot of Radisson Batam. He was so nice as to spend time occupying the kids while we got ourselves checked in, even giving them friendly hugs and high fives too. Besides the warm welcome by Mismi and the staff, the kids also indulged in what they loved since the first time they came - the addictive welcome lemongrass drink with basil seeds! Yums! It's definitely a good way to get everyone settled down and we were looking forward to what was lying in store for us. Rated as a 4.5 star luxurious hotel, Radisson Golf & Convention Center boasts 207 rooms and suites, as well as 33 one-bedroom accommodations. For both times we were there, the housekeeping service was top-notch and we were impressed by the professionalism, efficiency and politeness of the staff. 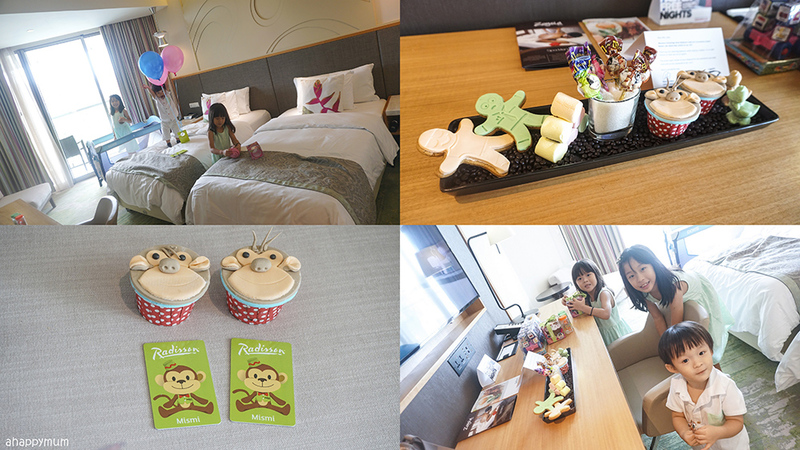 For our visit this time round, we stayed in the Executive suite and a connecting Deluxe room for the kids. Sitting on a high floor, the Executive suite occupies an area of 90 sqm and offers a splendid view of the Sukajadi golf course and the swimming pool. Ideal for business professionals, families with kids or couples who like to indulge, the suite comes with a working desk and workstation, two LED 40" televisions, rain shower shower cubicle, separate bathtub, in-room complimentary mini bar, complimentary WiFi, bar counter, refrigerator, dining table and chairs. Yes, it has a nice bathtub, a huge fridge and a homely dining table too! These are perfect for families with young kids so we were very thrilled to be staying here for three nights. The last I checked, a one-night stay in the Executive suite costs about SGD190-240 and prices vary depending on the period of stay, how far in advance you book and the demand during that time. Nonetheless, I thought it sounded pretty reasonable for such a comfortable and luxe hotel. I will be taking you on a short tour in the video below but here are some pictures taken of the suite so you can have a better idea. See the inviting queen-sized bed and enormous living room? The space was so huge that the 40" TV looked kind of small in it. How huge does it feel? Let's just say we played hide and seek for a good half an hour and still managed to find a handful of good hiding spots, which totally delighted the kids. Inside the bathroom, you can find toiletries which come in handy travel sized bottles and these are from Ritual, a well-known body care brand from Netherlands which strives to make use of organic ingredients to create high quality, luxurious products. This is one of the things I love most in the suite - the bar counter! 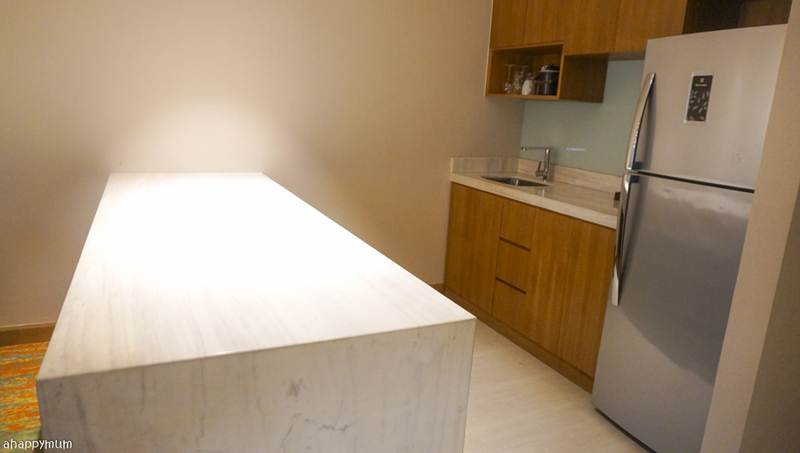 It was so inviting that we decided to have in-room dining not just once, but twice. 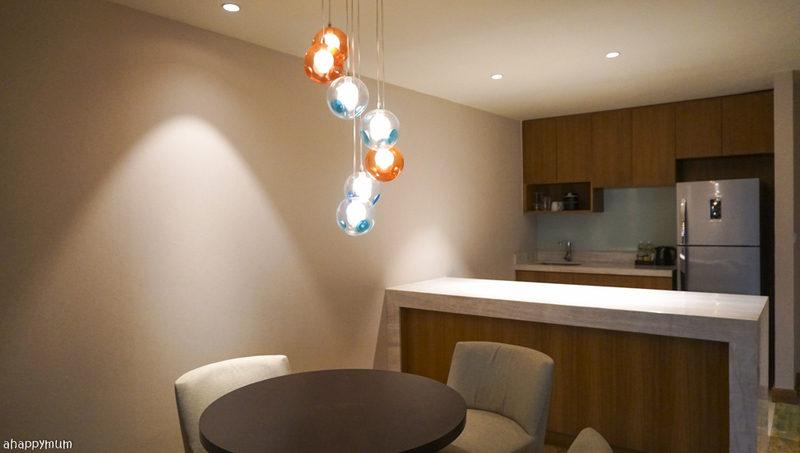 Being able to dine in the comfort of the suite made it feel much more relaxing for us as parents. This was mainly because the kids were free to run around after they had finished while being confined in a safe space and therefore the hubby and I could tuck into our food and sipped our wines. Yay! Even though the suite was huge, it only had one bed so we were glad to have a connecting Deluxe room for the kids which came with twin beds. What impressed us was how the room was nicely set up and waiting for us to step in. There was a tray of yummy chocolates and candies that the kids couldn't get enough of (it was near Christmas when we were there), the baby cot was already set up properly, and there were even three helium balloons - two pink and one blue - to greet the kids when they came into the room. No wonder they were very excited to be sleeping in this kids' room! Okay, I admit the hubby and I eventually had to split up to sleep with the kids so it was a relief that we had such nice beds to sleep in. Is it just me or do you love hotel beds too? 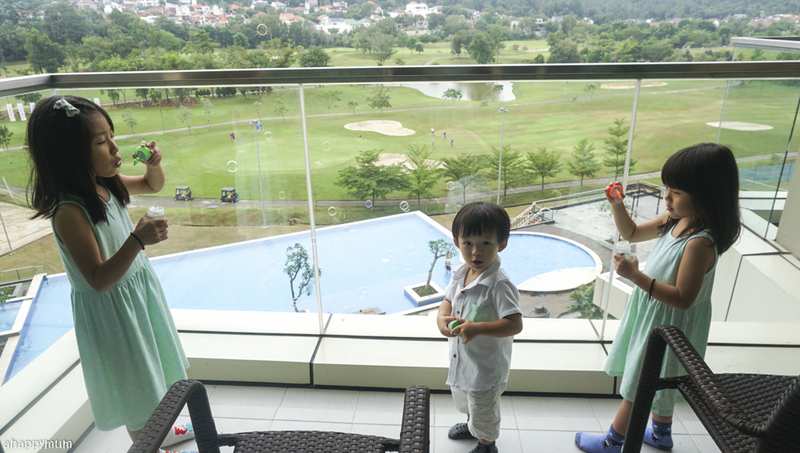 Having a spacious balcony with an awesome view meant that the kids could spend some time here gazing at the golf course or swimming pool, or just playing with bubbles and among themselves. We wanted this holiday to be as chilled and as relaxed as can be, so instead of taking it at a hurried pace, we just wanted to take things slow and easy this time round. 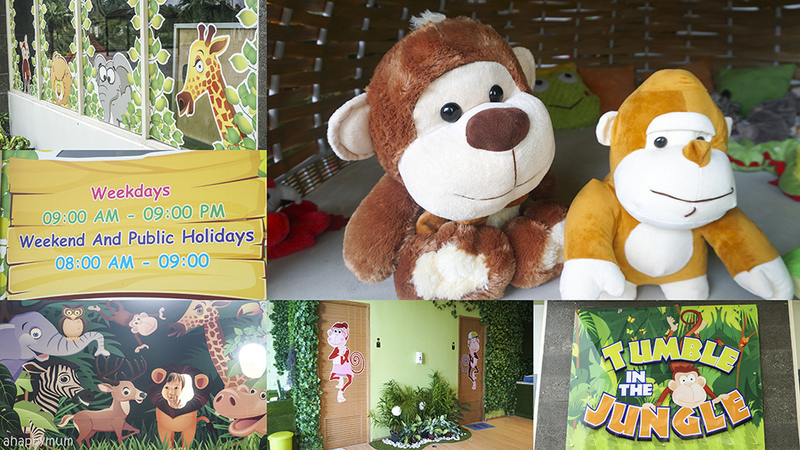 INTRODUCING "TUMBLE IN THE JUNGLE"
In my previous post, I shared with you about the Kids' Club and mentioned that while my kids loved playing there, it didn't look like there were too many toys or activities and I kind of wished that they had more to offer, given the huge space available. I think my wish kind of came true because within the short span of six months, the entire Kids' Club was revamped and it now boasts a new name called "Tumble in the Jungle", is filled with beautiful jungle themed wallpapers and tree vines hanging from the ceiling, has a big, lovely tree house with cute animal plushies in the middle, a table soccer game, a ball toss game, hopscotch and more! 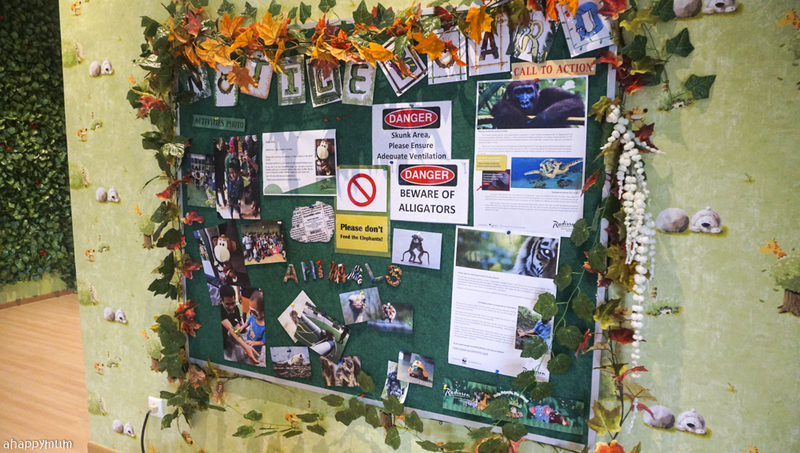 I saw this noticeboard in the Kids' Club that talked about animal conservation efforts but what caught my eye was this notice that stated that by taking a picture in Kids' Club and emailing it to Radisson, the hotel will award the family with a complimentary Saturday buffet dinner if the picture gets used on their Facebook page. Not a bad way to encourage people to start snapping away! The girls were happy to get the chance to play puzzle games at the computer station because Mama hasn't started on letting them play computer games at home and we don't own an iPad too. Haha. 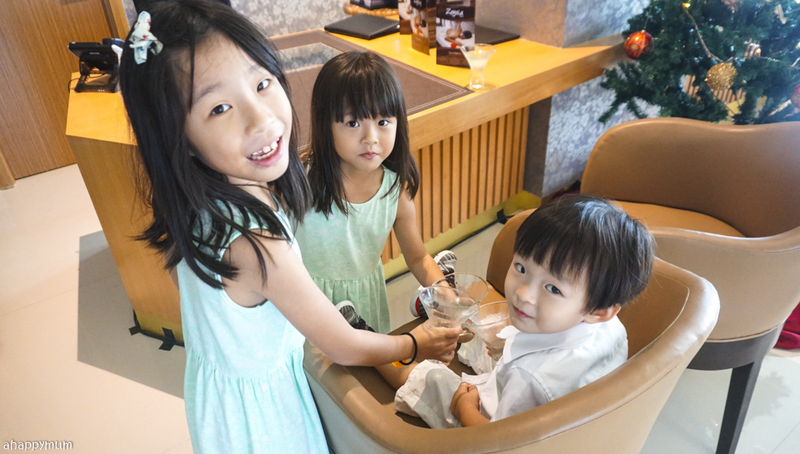 That kept them occupied and happy for a good half an hour while the hubby and I went for our much deserved spa session. More on that later! 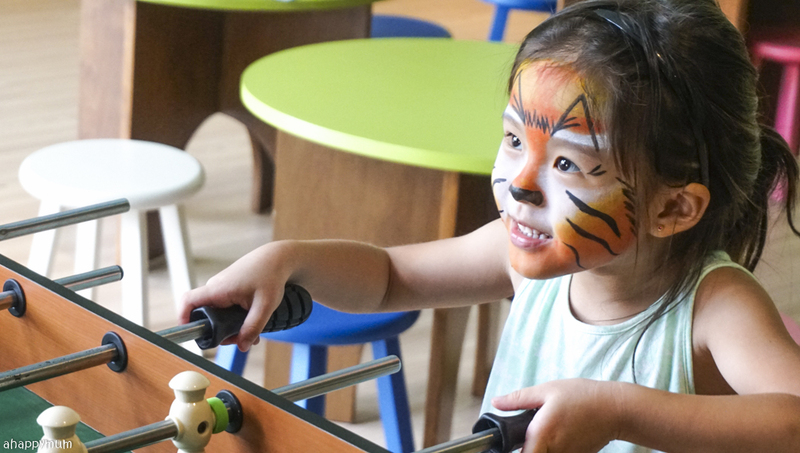 Moving onto the two new and most exciting highlights of the Kids' Club which take place every weekend, these are 1) Face Painting and 2) Meet the Animals sessions. 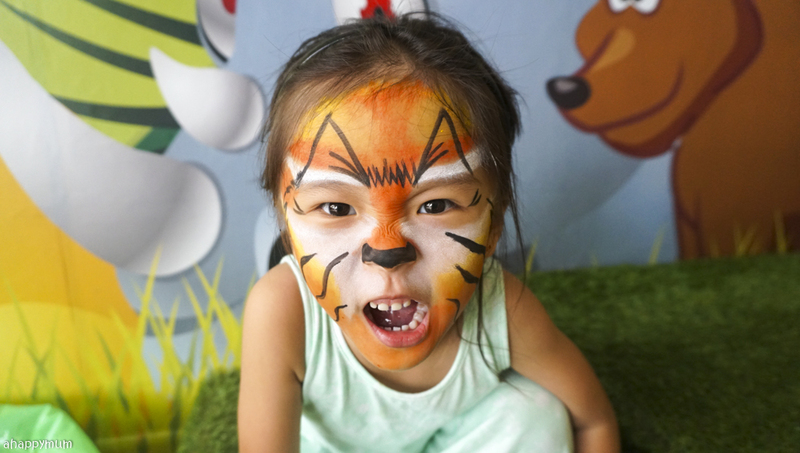 My kids are always very excited whenever they get to paint their hands or faces so it was nice to see them become a tiger and a butterfly as they tumbled in the jungle. 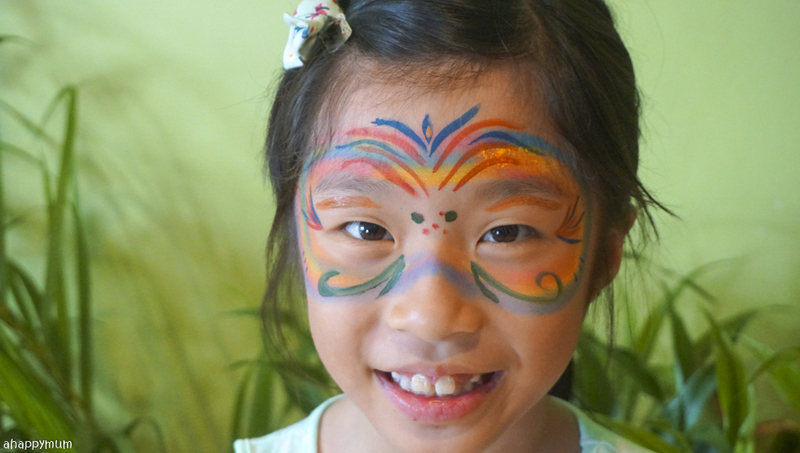 What fascinated me was that the face painter was one of the hotel staff but I must say she had the patience and really made an effort to paint every stroke and detail nicely. Thanks for making the kids so happy! 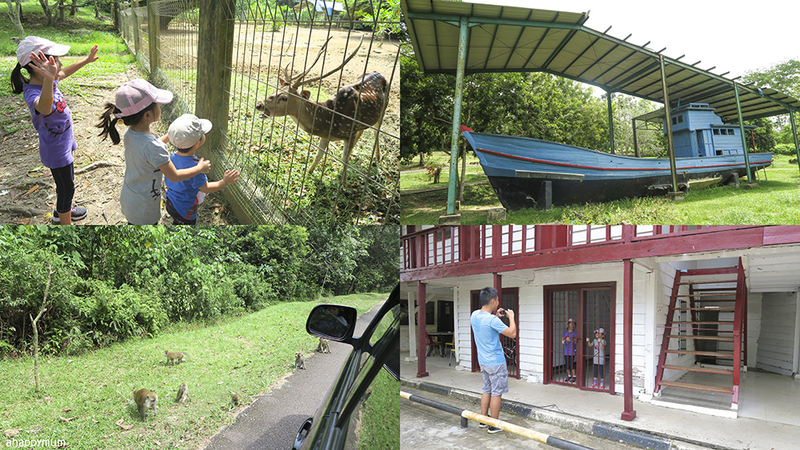 The best part of the trip, according to the kids, had to be this - the chance to come up close and interact with animals! By animals, I actually mean reptiles in our case. We did hear that there are usually sugar gliders too but alas it was their mating season and we didn't get a chance to see them. 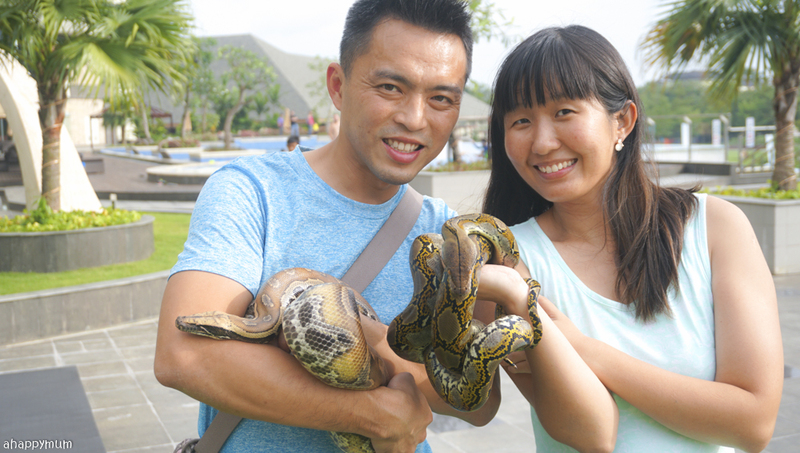 Instead, we did come up close with a few geckos, iguanas and even pythons. See how fearless these two girls are? They actually surprised some of the hotel staff because they didn't inch away from the animals but instead requested to hold them in their palms, put them over their shoulders and kept stroking them as if they had been our pets for a long time. Like seriously, where do they get this kind of courage from? 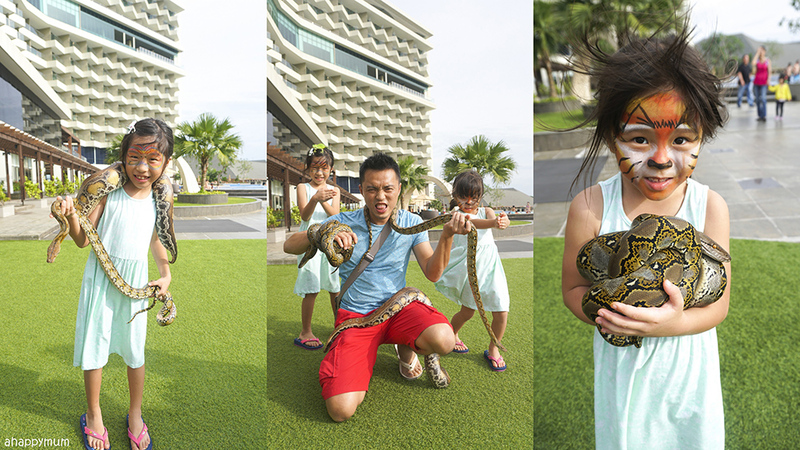 Definitely not from me because you should have seen how long I hesitated before I was brave enough to hold the snakes. An incident happened to Ariel and that was when one of the geckos she was holding bit her forearm and left bite marks and a little blood. We presumed it was because of the hot weather and how everyone was trying to hold it and keep it from running away. She was the only unlucky one who got bitten and so I wasn't surprised when she started to cry. In fact, I told her it was okay to take a rest since we had already been with the animals for, I think, a good half an hour already? While other hotel guests came and went briefly, we were the only family who stayed there from start to end and that was only because my kids refused to leave. Yes, even though she was once bitten, this brave little 5-year-old wasn't twice shy and she wanted to go again after a few minutes! Not only did she hold the geckos again, she also went for the pythons and was so plucky to have them wrapped over her shoulders and placed on her forearms too. I was indeed very amazed at her resilience and it was good to see that she could overcome the fear too. As for Angel, well, she was the most patient and loving one of the lot who treated each and every animal as if they were hers, especially the baby iguanas who seemed to love her so much and wouldn't let go of her when other kids wanted to have a try too. We ended up spending over one and half hours just being up close with these animals but seeing how the kids truly enjoyed every bit of it, I was glad we managed to make the most of this rare opportunity too. 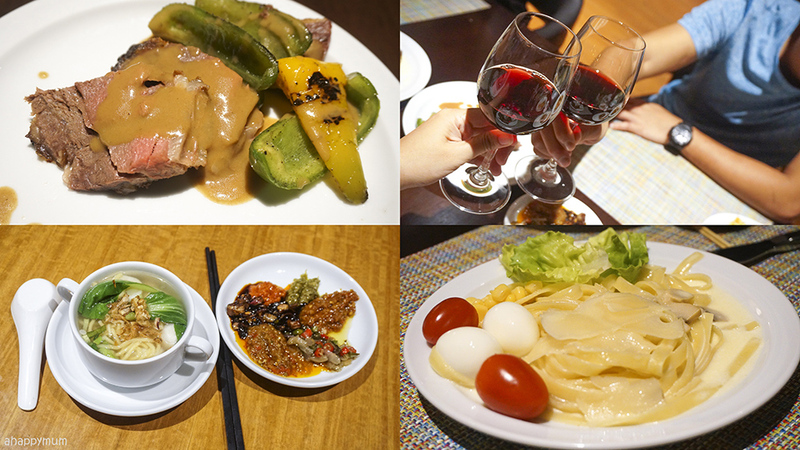 Now that the spa is taken over by the hotel management instead of being run by a third party vendor, it was easy for us to spot the differences on our second visit. For starters, the whole place now uses blackout blinds and while it was brightly lit previously, the new spa looks much darker and dimmer. I personally prefer this new ambience because it seemed so soothing and calming the moment I stepped in. As parents of three with no help, it's almost impossible for the hubby and I to even go on a date, much less indulge in a couple spa session. So this was definitely a once in a blue moon treat for us and you bet we relished every minute of it. 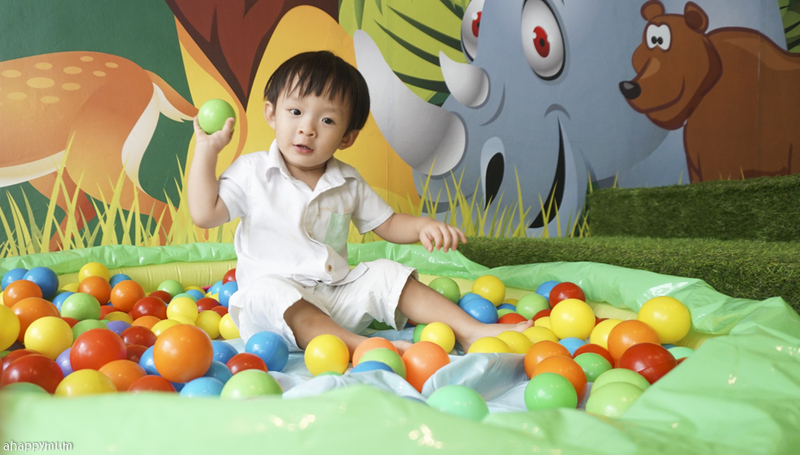 If you require babysitting service during your stay, you can request for it at the concierge too. I chose to go for a Indonesian traditional massage while the hubby took up the Swedish massage. It was one of the rare times that I felt honestly relaxed and I realised how much tension was in my body, even though theoretically I don't have a job other than being a SAHM. For those 60 minutes, I told myself to let go of all my worries and just enjoy that truly deserving massage. It was really good to have the hubby beside me because he honestly needed to take a break too! Yay for couple time! 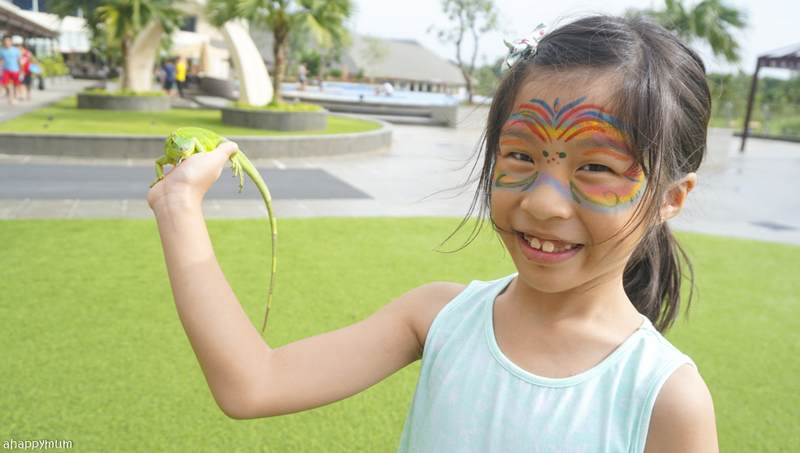 I've shared about this in detail in the previous post but just so you know, here are some other family-friendly activities that you can do during your stay in Radisson Batam. 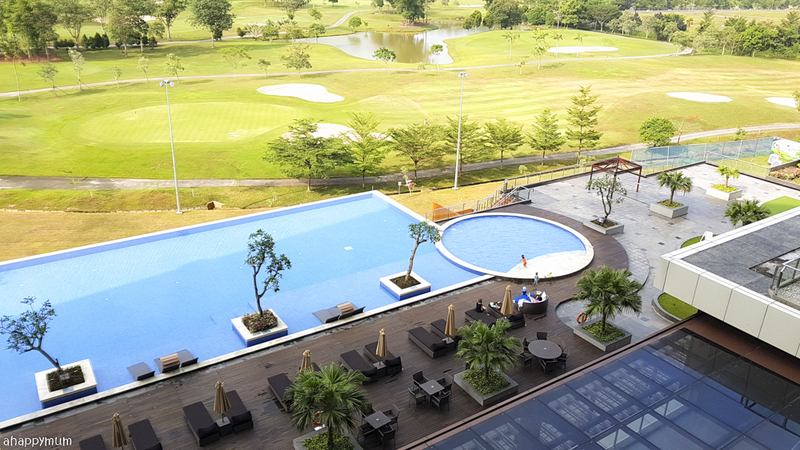 We love the outdoor infinity pool at Level 1 which has a breathtaking view of the golf course. There is also a wading pool beside the main pool which is good if you have toddlers and a Jacuzzi pool for the older ones too. What I did this time was to take the two younger ones for a swim while the hubby slept in with the eldest. We brought some breakfast over from the restaurant, which is right behind the pool, and I must say it felt heavenly to be able to bask in the sun and tuck into the spread while keeping an eye on the kids at the same time. 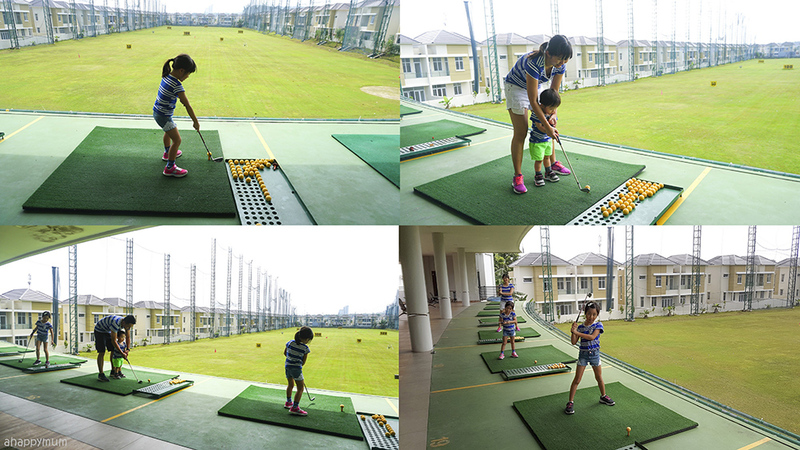 My kids tried out golf for the first time at our previous visit and they loved the experience! 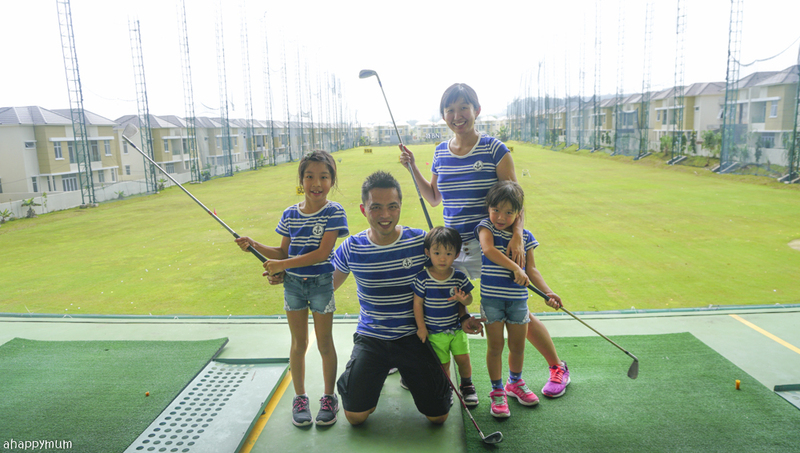 So, since this was a rare treat for them and probably one that won't happen when we got back to Singapore, we took them to the Sukajadi driving range again for some family golfing fun. I think they enjoyed the buggy ride just as much too! Obviously, the majority of us were amateurs and couldn't really swing the club well, much less hit the ball far. Haha. Oh, they have kid-sized clubs available for the little ones which was really a thoughtful and kid-friendly initiative too. Nonetheless, it was a good learning experience once again and a great way for us to bond too. 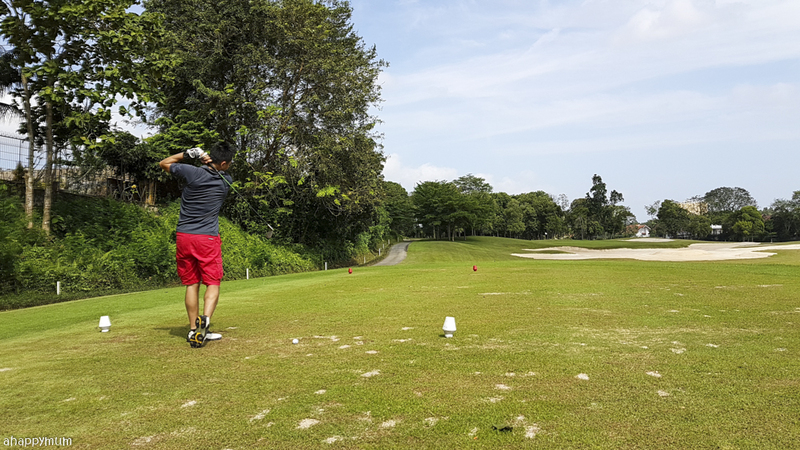 For the semi-pro golfer aka the hubby, he conquered his 9-hole one morning and did it in 56 strokes, which according to him was not a bad result. I was happy to take the kids to breakfast myself and give him some time off to enjoy the sport too! 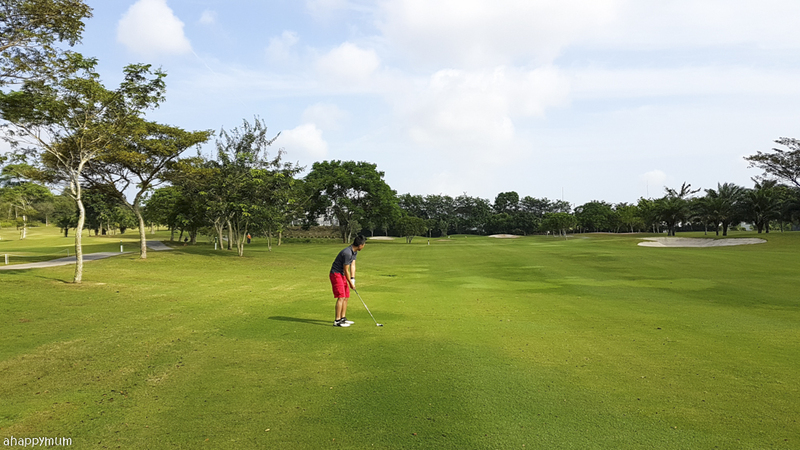 It is so convenient that the Sukajadi golf course is located right next to the hotel because you don't need more than five minutes to get there which saves a lot of travelling time. 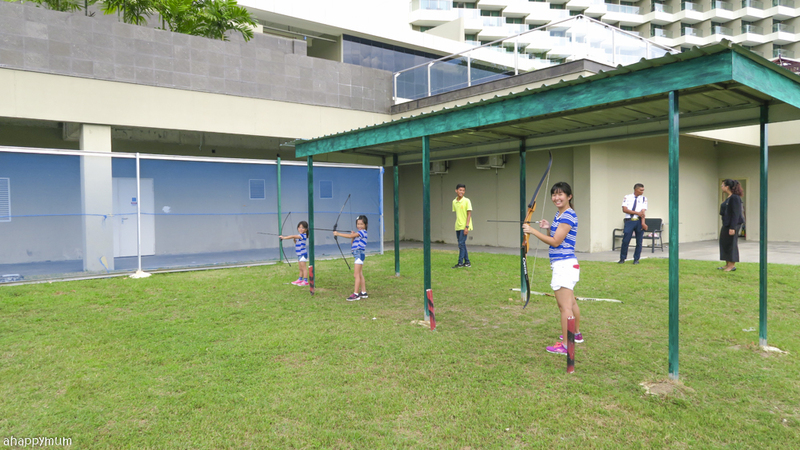 We tried out archery again since it was conveniently located below the hotel and I think my kids started to get the hang of it. Yippee! Thanks to the friendly staff who were patient in guiding them, they had the opportunity to learn and then to try it all on their own too. Catch Ariel in action in the video later! 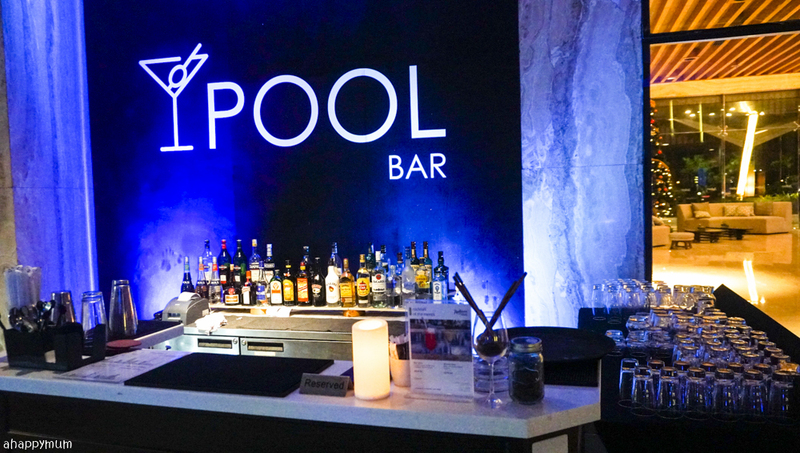 A new addition to the hotel would be the Pool Bar which comes with a pool table and sits outside the hotel near the swimming pool. 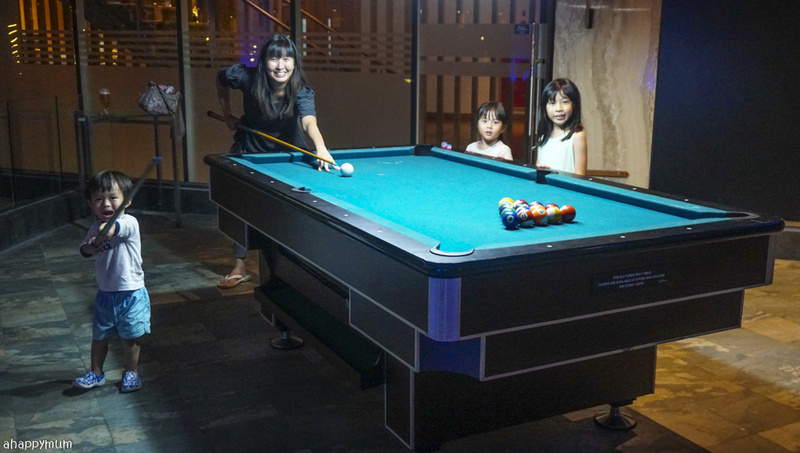 Well, it's not often that mums and dads get to enjoy a drink or two while letting the kids have a go at pool, right? I remember I used to like playing the sport when I was in Secondary school with my friends too so why not cherish every opportunity I get to do it with my kids now? You need to insert a coin into the machine for the game and each game costs IDR10,000 which is not even equivalent to one Singapore dollar. Cheap, right? We didn't get a chance to do this the last time round as our stay was too rushed so this time, we made sure we had ample time to go out of the hotel and do some sightseeing. 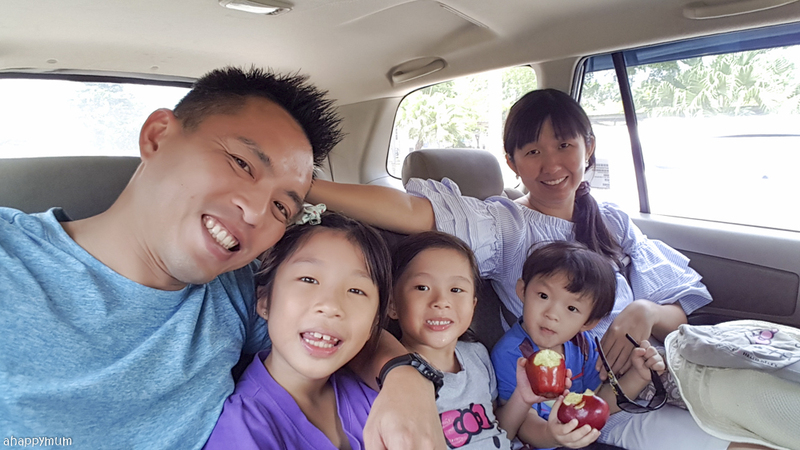 In fact, we dedicated a whole day for it and visited places like the Vietnam Camp, the famous Barelung bridge, a dragonfruit farm, the new Viovio Beach and along the journey, we also saw monkeys, geese and even deer too! 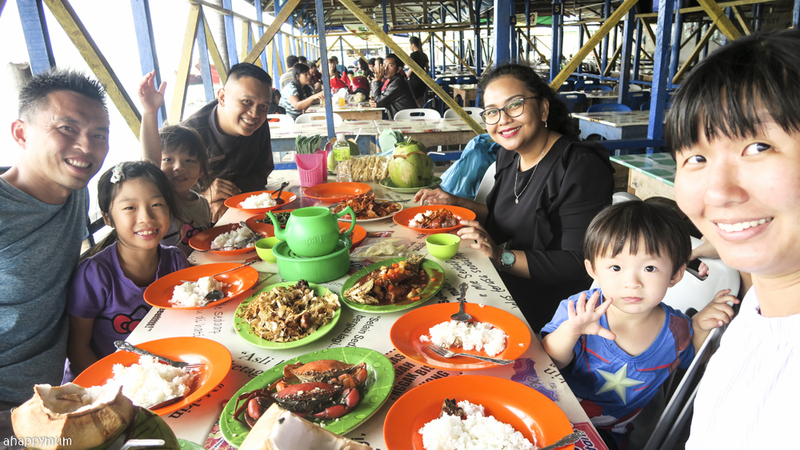 For our lunch, we specially requested to visit a kelong seafood restaurant and with recommendations by the Radisson staff, we made our way to Tanjong Piayu. What was most impressive was that the hubby was given the chance to catch our own fish (to eat for lunch, yes)! And he did it not once, but twice. We followed him all the way on the wobbly wooden platforms and it was yet another kind of rustic experience for the kids. Wanna guess how much this meal cost? 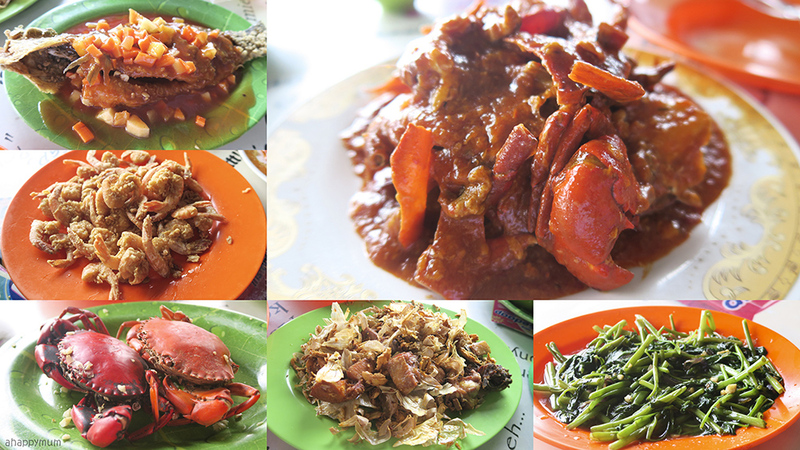 We had four (small) crabs, one seabass, one grouper, shrimps, chicken, two plates of kangkong and coconuts too. And the answer? SGD60. Yup, totally amazing and absolutely worthwhile. 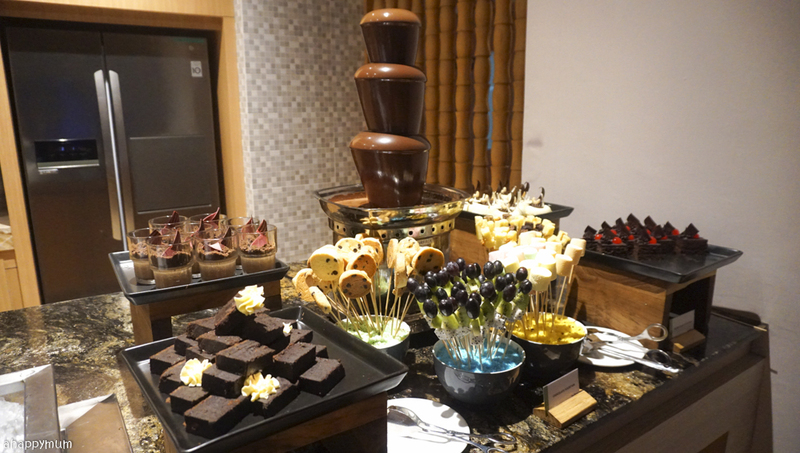 One of the things we enjoy most at Radisson is the... FOOD! Yes, we think Bite restaurant is one of the better restaurants we've been to overseas and we were once again quite impressed with some of their signature dishes. 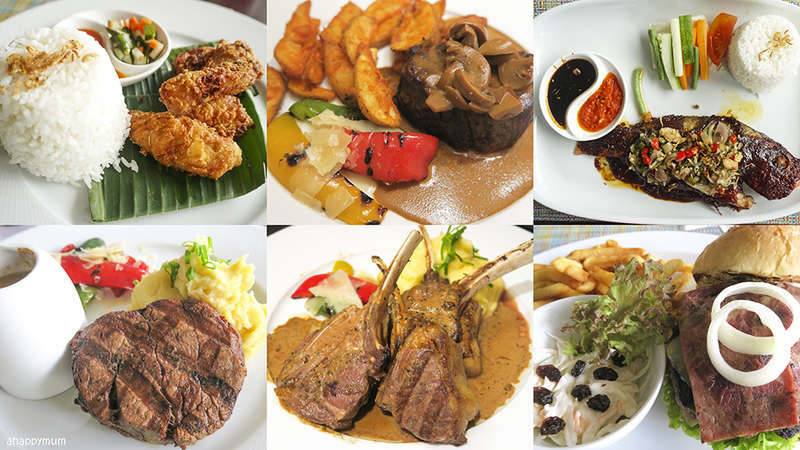 Our favourites are the Ikan Bakar, Tom Yum soup, lamb loin and beef ribeye. On the weekend that we were there, the restaurant was fully packed and it was plain to see that their business has prospered from our last visit. And I'm not in the least surprised considering the new array of activities that the hotel management has come up with. 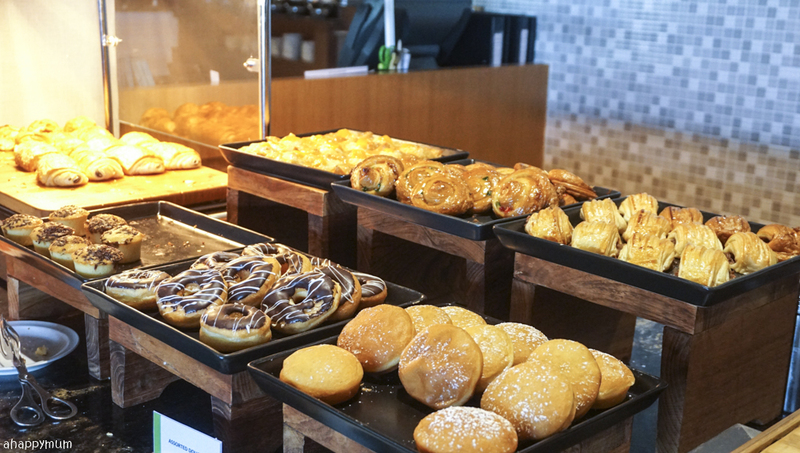 When it comes to the buffet breakfast and weekend buffet dinner, guests will be spoiled for choice because there are just so many stations to choose from. 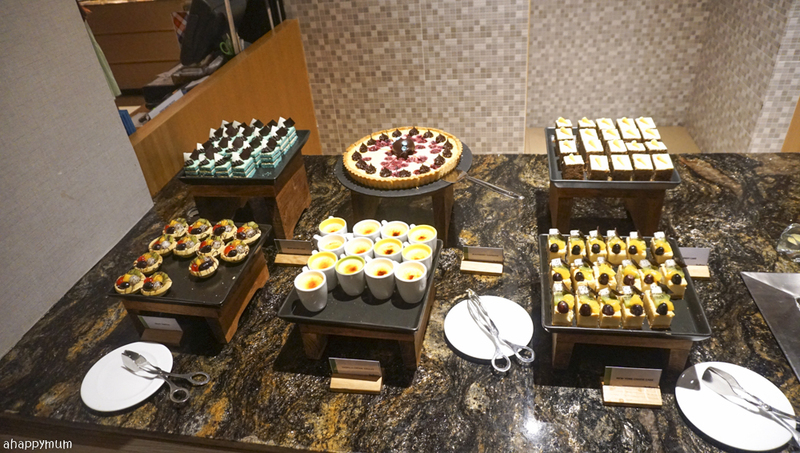 For instance, I couldn't even finish tasting all the desserts that I wanted because there were too many of them. Such a pity! As for the kids, they were always happy to dine here. 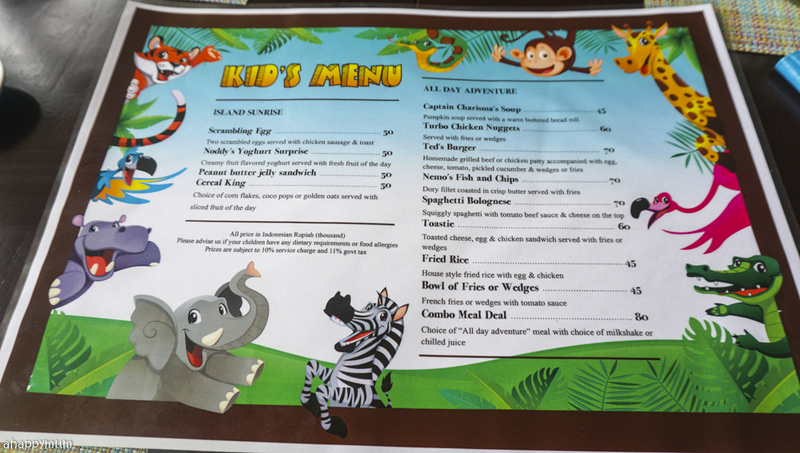 Even though the selection in the Kid's Menu was not wide, it had some of my kids' favourites such as carbonara, fish and chips, burgers and chicken nuggets. 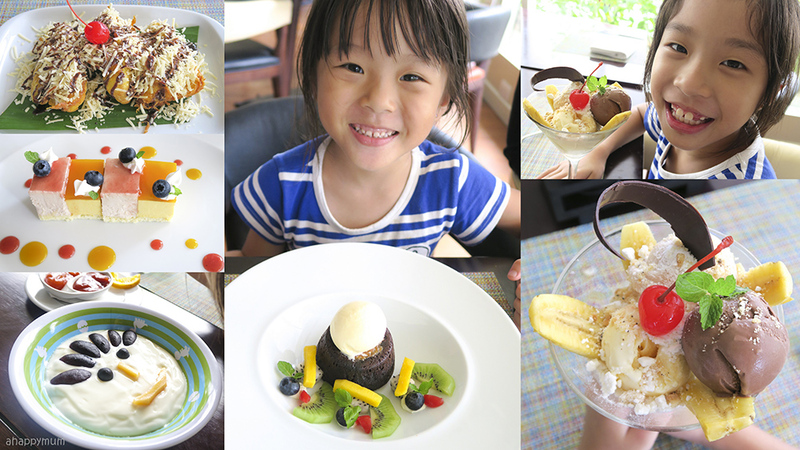 They were more than delighted to have desserts after a full meal too and it usually consisted of yummy ice cream. After all, we were on holiday and it is okay to indulge, right? 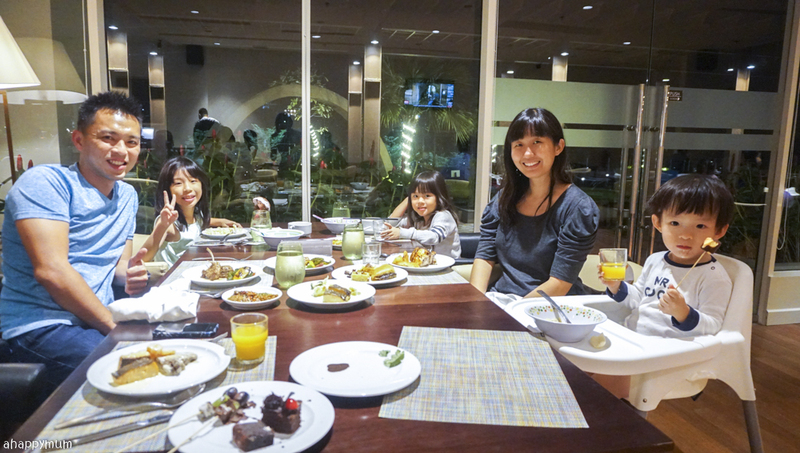 While it felt great to be able to dine in the restaurant which opens all the way till 11pm (we came here late one evening because of a late lunch and the kids wanted to have a swim first), what we enjoyed most this time round was the in-room dining. Oh, but just so you know, the restaurant is right beside the Kid's Club so if your kids are okay to go and play by themselves, you can indulge in a peaceful meal with your other half. Awesome, right? Unlike the previous visit when we made our way to the restaurant for every meal, this time round, we decided on in-door dining, which is available 24 hours, because the toddler was still sleeping and I thought it would be nice to make use of the dining table and chairs in our suite too. 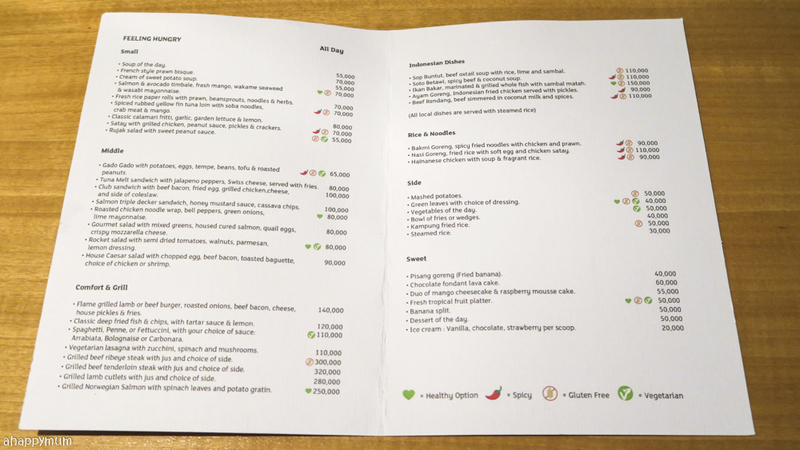 All I had to do was browse through the menu which can be found in the room and make a call to order our food. Easy peasy! The food arrived promptly in about half an hour as promised and we were all very impressed by how the staff unwrapped the dishes and laid them out neatly on the table. What was even more impressive was that the food was still served hot, the fries were still crispy and the ice cream still hadn't melted! Fwah! That totally deserved our thumbs up. 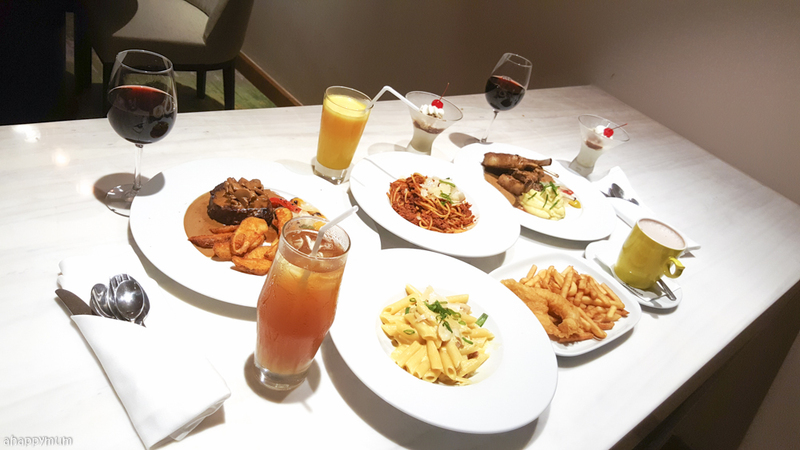 Having tried out both dining in the restaurant and in-room, I have to say the taste of the food doesn't differ much so if given the choice, I would gladly do choose in-room dining if it means my kids are safe to run around after their meal and we can enjoy our desserts while watching a movie. Thanks to Radisson Golf & Convention Center for going above and beyond in caring for our needs. It isn't easy to be a luxury hotel that is family-friendly at the same time but you've achieved it with ease and style - and with lots of effort behind the scene. 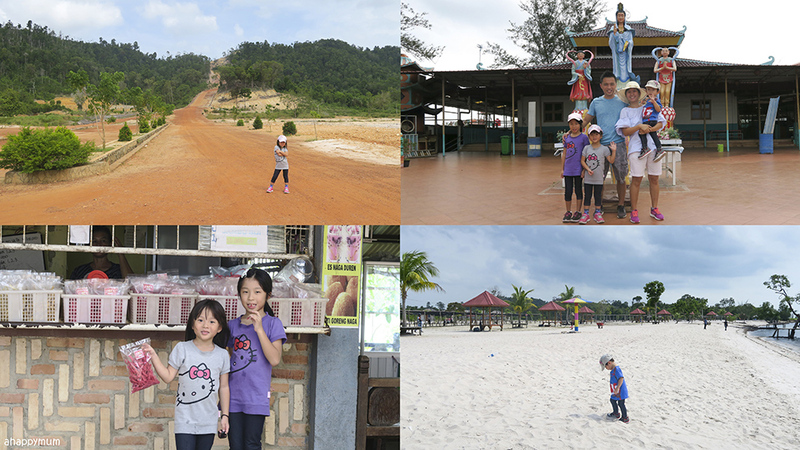 We hope to be back again next time and let the kids have a blast on a getaway that doesn't require us to venture too far from Singapore! Before you get to the end, watch this video (make sure you do) to see more snippets from our stay! 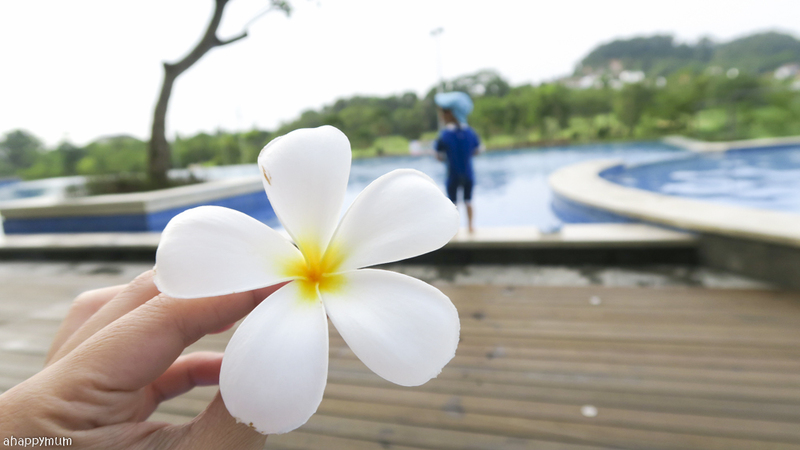 2D1N Family Stay Packages (inclusive of breakfast, couple spa and F&B voucher) to TWO lucky readers! Here's how you can join! To participate in the giveaway, leave a comment in this blog post with your name, email address and tell me what you look forward to most in Radisson Batam. Head over to my Facebook post or Instagram post, or BOTH, and follow the steps there. I will be picking a winner from Facebook and another from Instagram, and you are free to join both to double your chances. This giveaway ends on 25 February 2359hrs and the winners will be announced here and on my social media. The winners will have 48 hours to respond or new ones will be picked. This giveaway is in no way sponsored, endorsed, administered by or associated with Facebook or Instagram. Good luck, people! 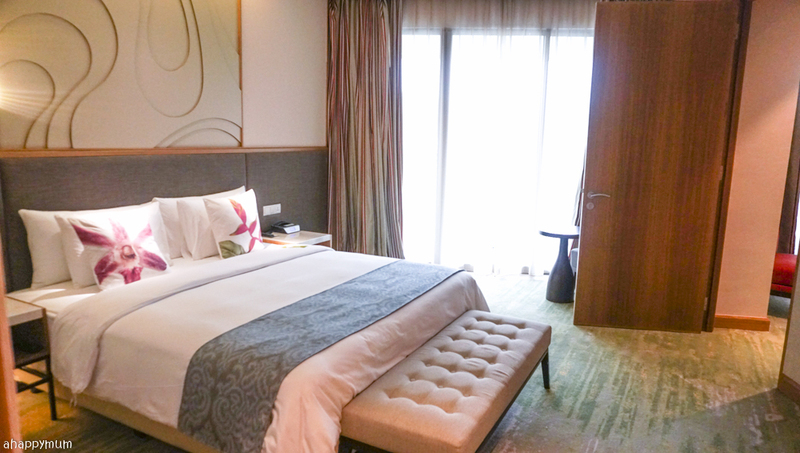 Disclosure: We were invited and hosted by Radisson Golf and Convention Center for a 4D3N stay in writing this review. All pictures and opinions are our own. 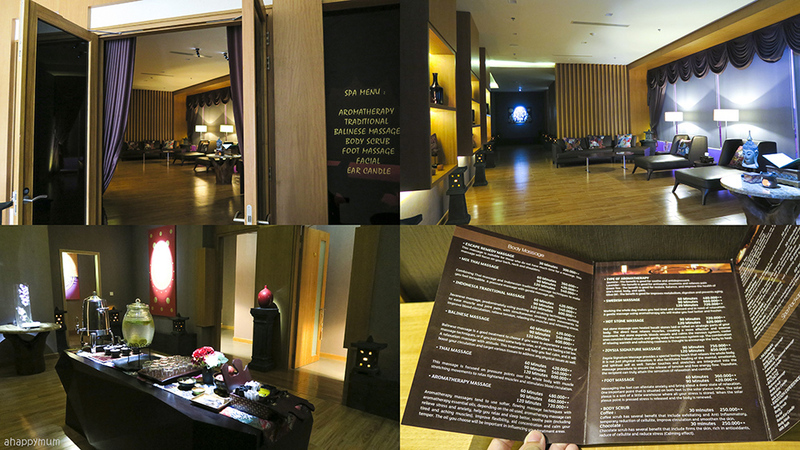 I'm looking forward to most in Radisson Batam is the new Zoysia Spa for an ultra-pampering spa sesh! My wife and I really look forward to the spanking brand new Zoysia Spa! Oh and my 2 kids look forward to the revamped Tumble in the Jungle! that interaction with reptiles is so cool! 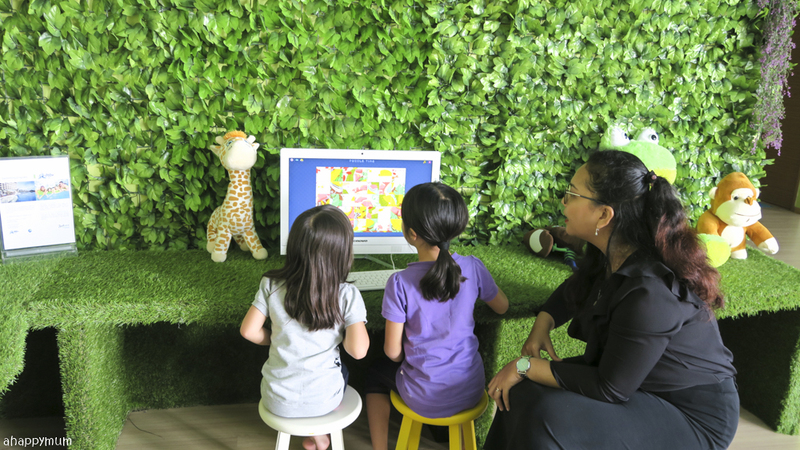 I am looking forward to the kids club as my kids will be totally engaged and happy, we Love �� to see them happy and excited! Personally, I'm really looking forward to a nice spa treat at the Zoysia Spa! I am looking forward for the family bonding and for the outdoor activities for my kids. They love playing archery on the play station so hoping they will experience the real one. Pity that this giveaway is more suitable for couple else I love to spend heaps of time playing with my girls at the Kids’ Club. Plenty of fun to while away time! 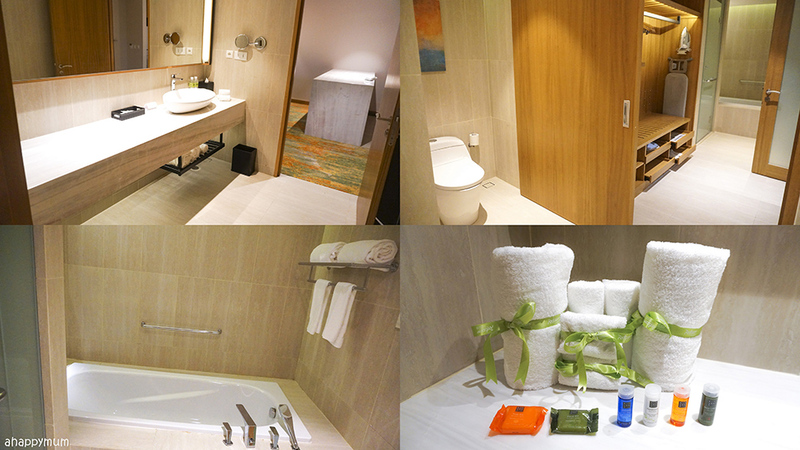 For couple time, we love to have a refreshing and relax spa treat! Definitely kid club Tumble in the jungle for my boy occupie activity packed, and the swimming pool. Perfect enjoy some quality family bonding time together. My hubby and I in need of a relaxation & also fun getaway! Away from the city! 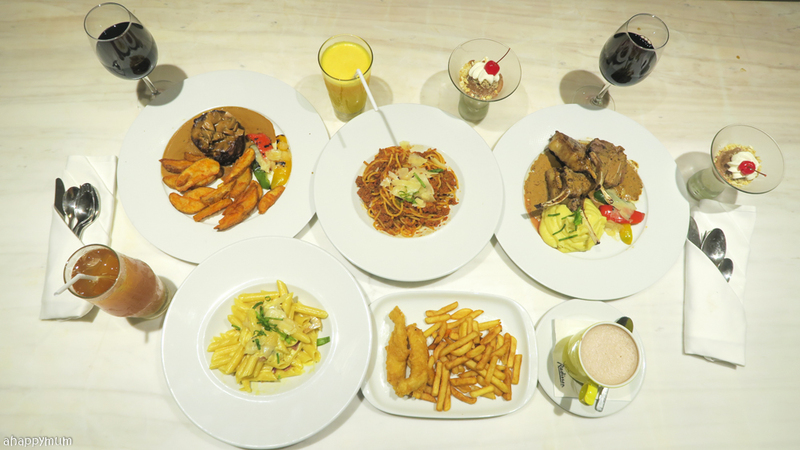 We would like to try everything thats mentioned in this blogpost! Look forward to a bonding trip with my boys! 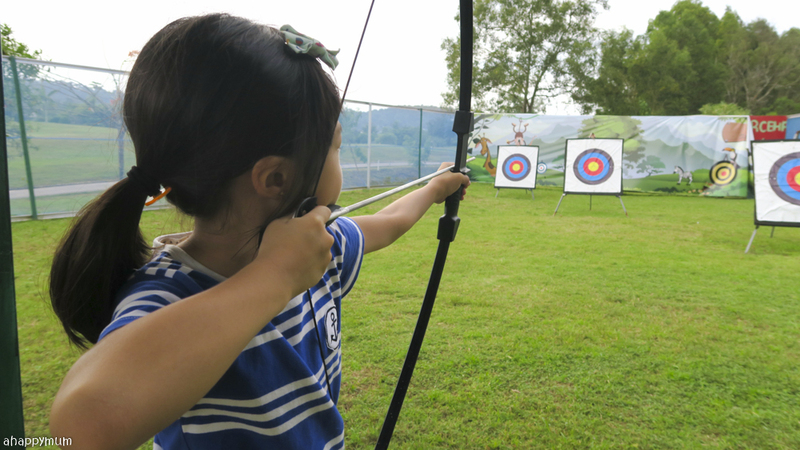 Looking forward to try out archery with the kids! Looking forward to try the kids club with my son! 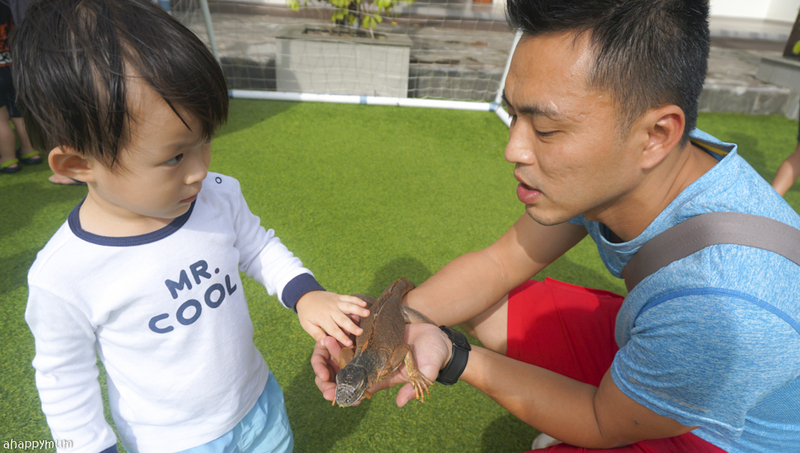 My family, especially my 2 boys would definitely look forward to the close interaction with the reptiles, the highlight of the Kids' Club. 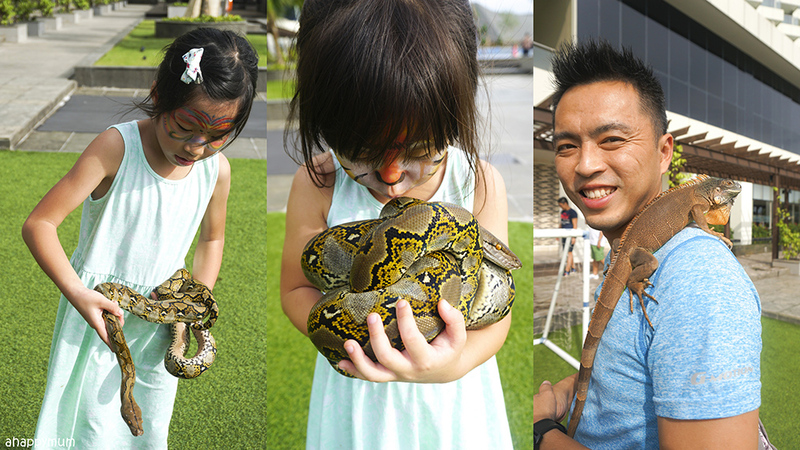 We had a similar experience with insects last year at Entopia in Penang and my then 4 year old and 2 year old loved it! The adults get pretty excited too! 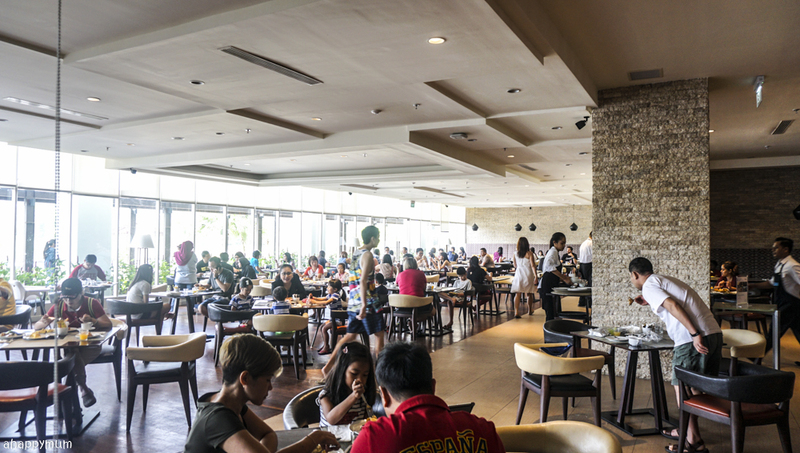 I am sure my whole family would have a splendid time at Radisson Batam. I'm so looking forward to the new revamped kids club! I am looking forward to playing with my kids at the Tumble in the Jungle and also the Indonesian massage for my wife and I. 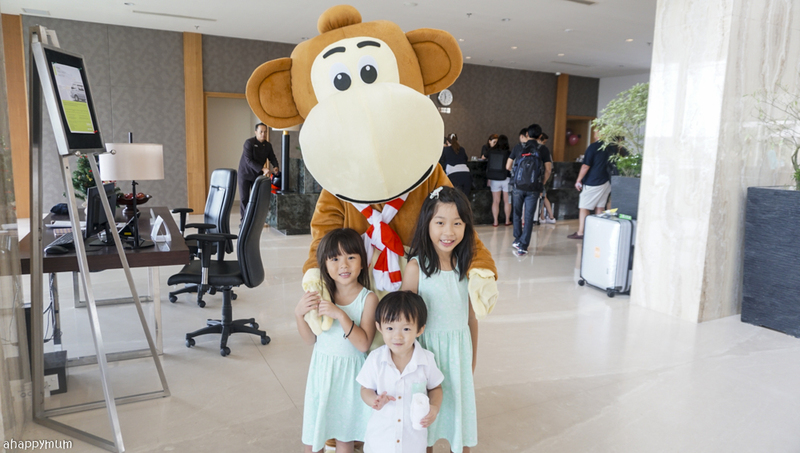 We arelooking forward to most in Radisson Batam is the Tumble in the jungle with my twins as they are animals lover! 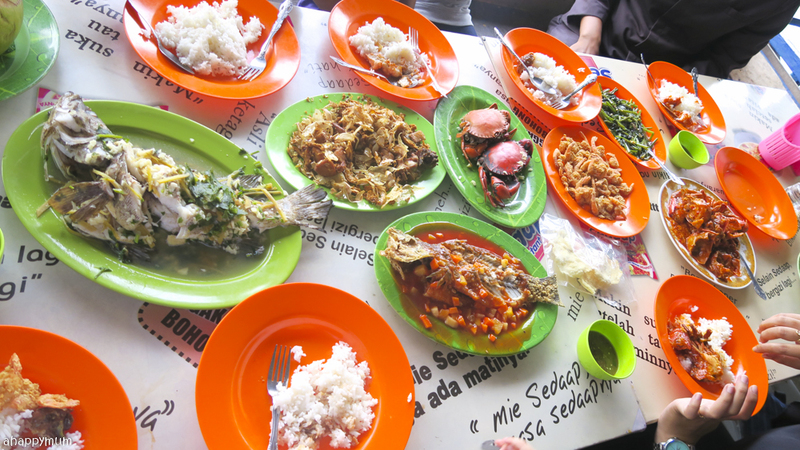 Am looking forward to spending time with my kids at the hotel pool and going for a kelong meal! Am looking forward to great family time with my 3 kids and new experiences with them. I am most looking forward to Tumble in the Jungle because I know my kids will love it and spend loads and loads of time soaking in it. I will then be able to sit at a corner and catch up reading my favourite books! Looking forward to releasing stress at the spa! 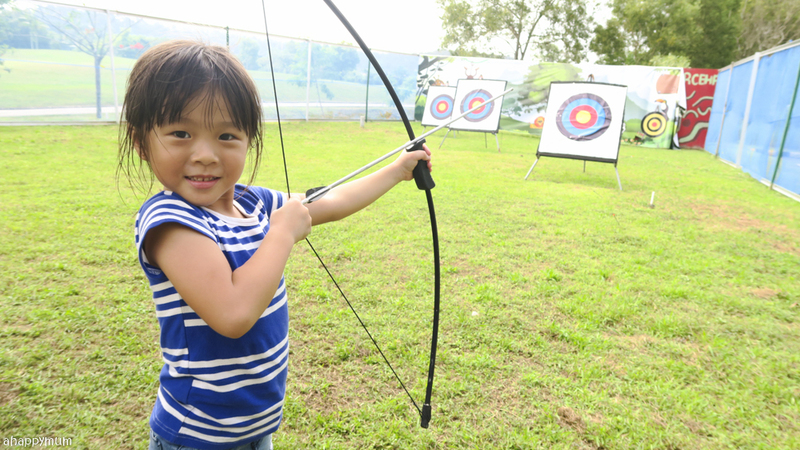 The kids will be excited over golf and archery! I look forward to the new spa with a cosy and relaxing ambience. 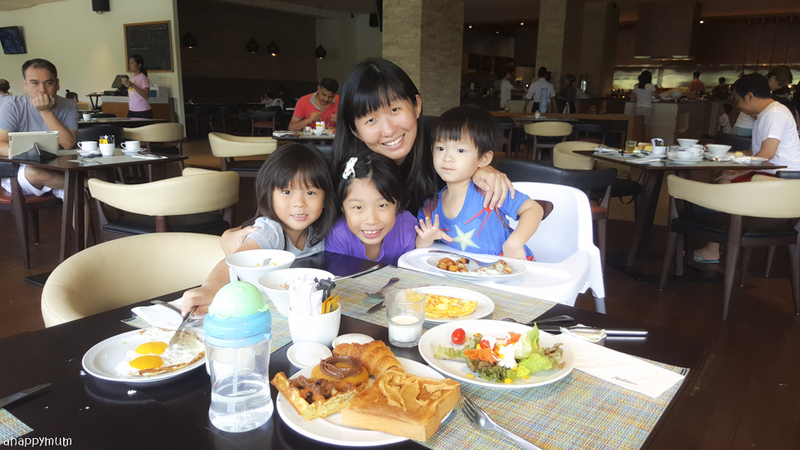 I look forward to the golfing and feasting with my kids who are also foodies! All activities look so good for the family. Looking forward to the connecting rooms, tumble in the jungle and Golf with the kids. What I look forward to the most at the Raddison is the babysitting service. With two Super active kids, need I say more! Thanks for the detailed review. Very useful for parents like me who need to know everything beforehand ��. 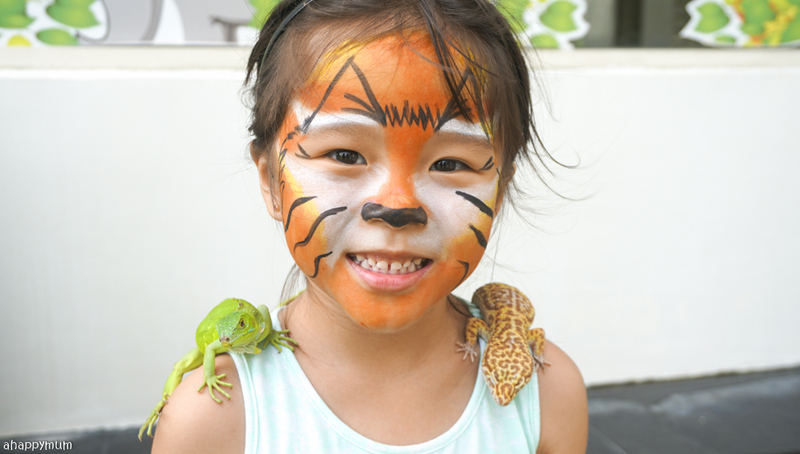 The kids would love to have an up close and personal encounter with the reptiles and try their hands at golf and archery! 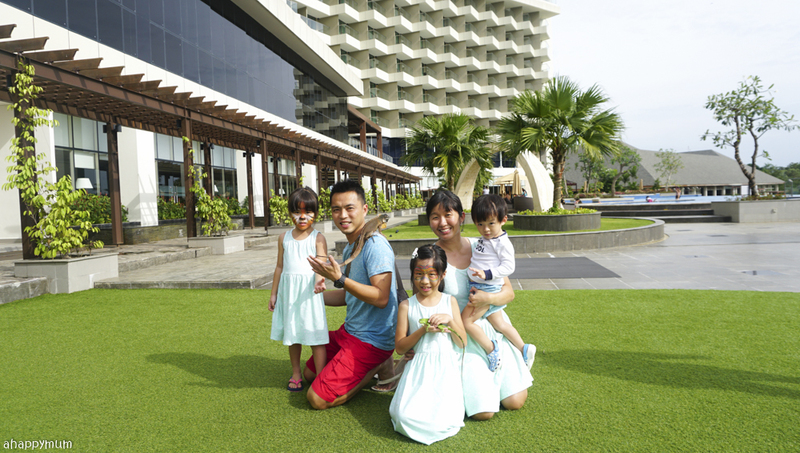 I look forward to a great family time at Raddison, especially taking part in the activities available for the guests. I believe this will be a wonderful bonding time with my loved ones, away from our busy lifestyle. Wow, didn’t know that there’s so much to do at Radisson. My girls will be thrilled .. They would most probably swim and I would get them to try Golf and archery plus get close and personal with the reptiles. Food indulging is the wife’s responsibility. 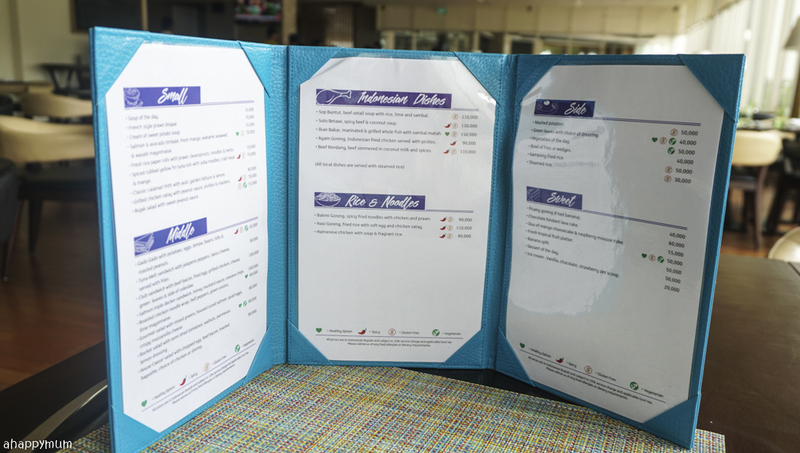 The array of delectable delights at The Bites Restaurent and trying out the the archery,golf and handling the reptiles! Love to try out the Tumble In The Jungle and let out the inner child in me soar! 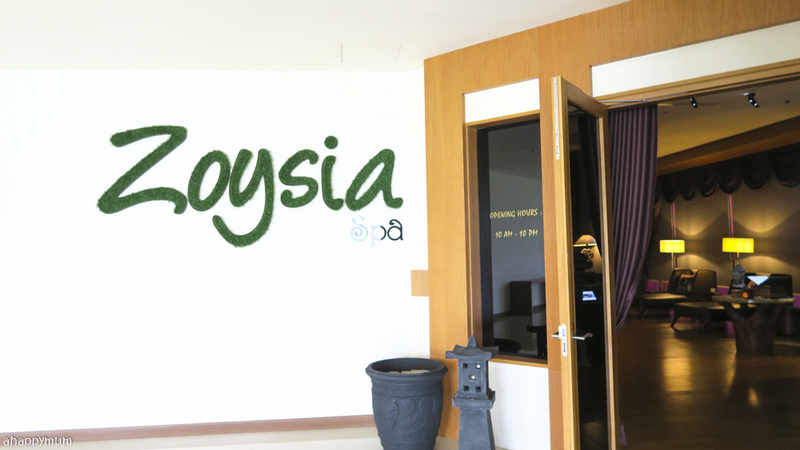 I would like to try out a couples massage at the new Zoysia Spa! 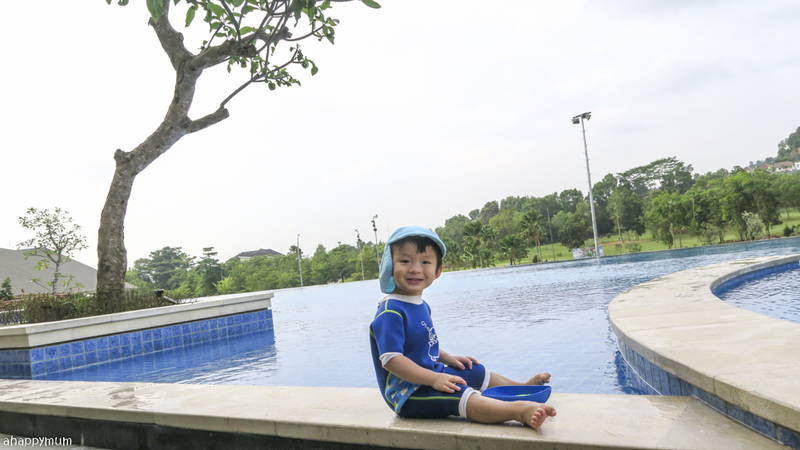 I love to laze around the swimming pool,having fun with archery,golf and particularly having a spectacular with my nephews and nieces! Hi! Been trying to comment for the nth time but everytime i check the blog again, the comment is not here. Trying my luck again. 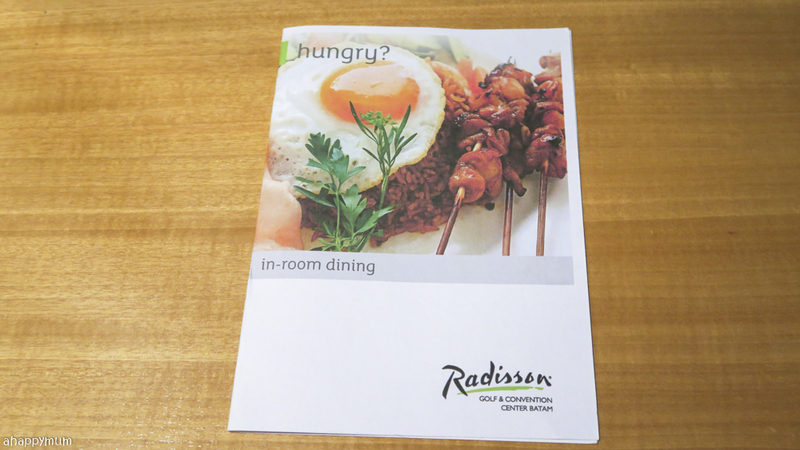 Im looking forward to the whole Radisson experience. The relaxation spa, the tumble in the jungle, the archery and golf and most specially the luxurious feel of the hotel. The review is very well written in details which makes me wanna experience all of them too with my family of course. We want to have fun at the swimming pool together. My girls will be contended with this simple activity. I am looking forward to spending some family times together with my hubby and teenage children. 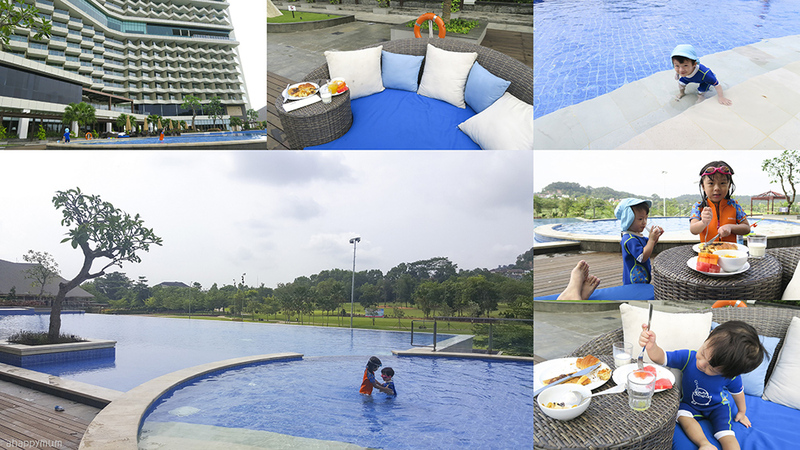 Even lazing around the pool is fun for us :-) Cheers! 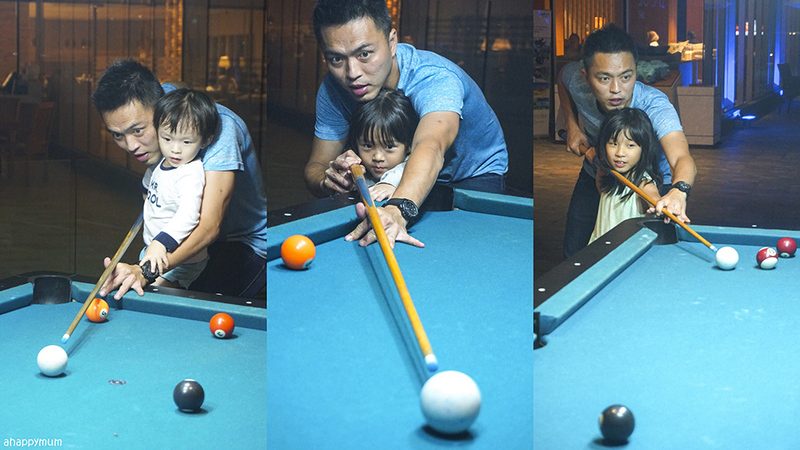 Looking forward to more family time at Batam! Looking forward to a very first holiday as a family. The relaxation spa and tumble in the jungle will be a bonus! I can’t recall when’s the last time me and my Hub has a relaxation time ever since our twins were born. Would love to check out the spa! 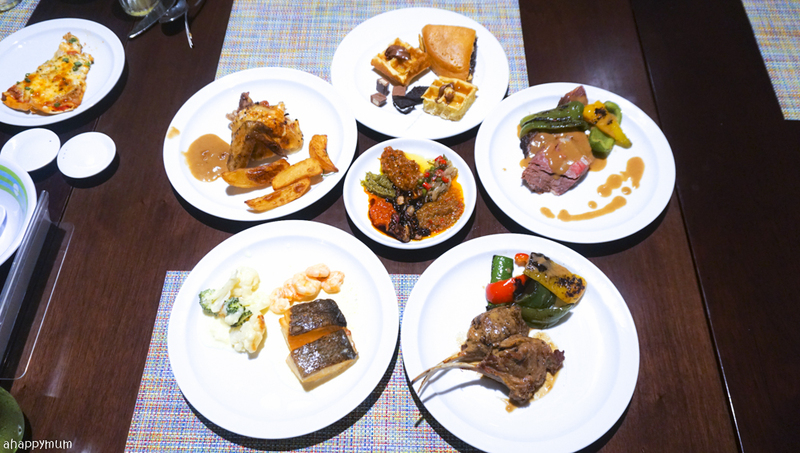 Our family will love to try out the delicious looking food from Radisson. 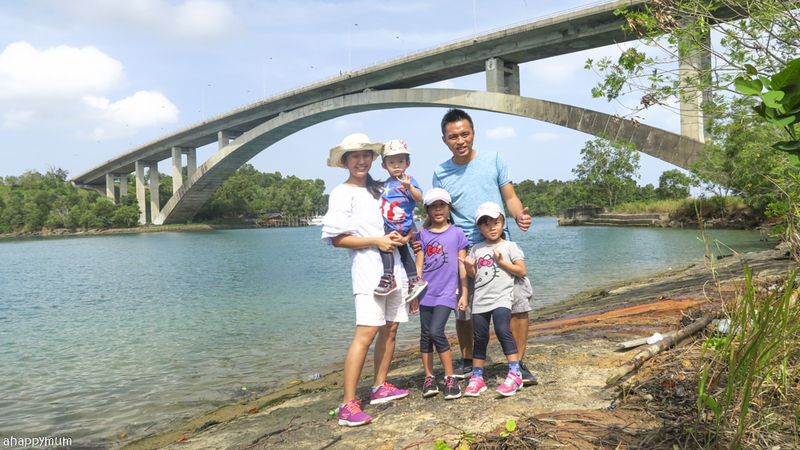 My wife been asking me to bring the kids to batam for so many times. But every time I will tell her "go batam for what, is a place for adults to go massage only" . 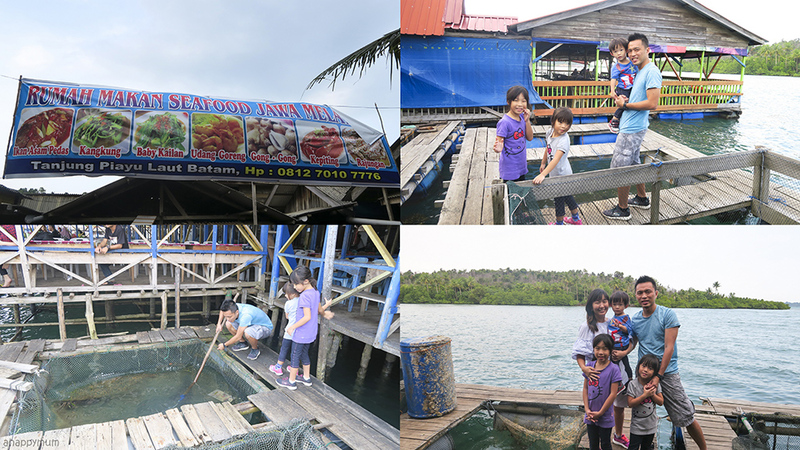 But after reading your blog, I realized I missed out a whole lot.. batam can be a fun getaway for kids too. I am looking forward to the couple massage most!! I am in the same situation like you no helper and I don't like to rely on my family or relatives or friends to watch over my kids. So ,most of the time, my wife and I can only take turns to go massage and simply no couple time at all!! This couple massage will be the best time for me and wife to have some couple time to chat and relax without the kids interrupting us all the time. 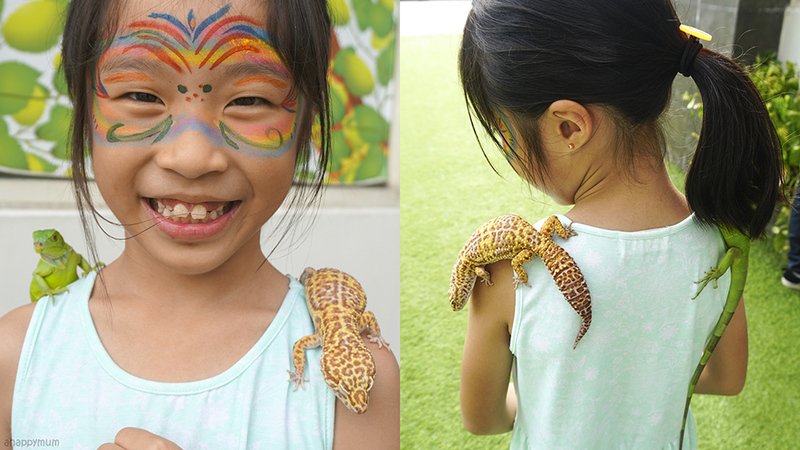 For my kids, they will love the up close personal interaction with animals(reptiles). My kids are the fearless just like yours and curious and adventurous type who love animals. They just loved to touch and try new things and things that are not allow they also love to challenge and often we got to nag at them wat are the "touchables" and the "untouchables" lol. 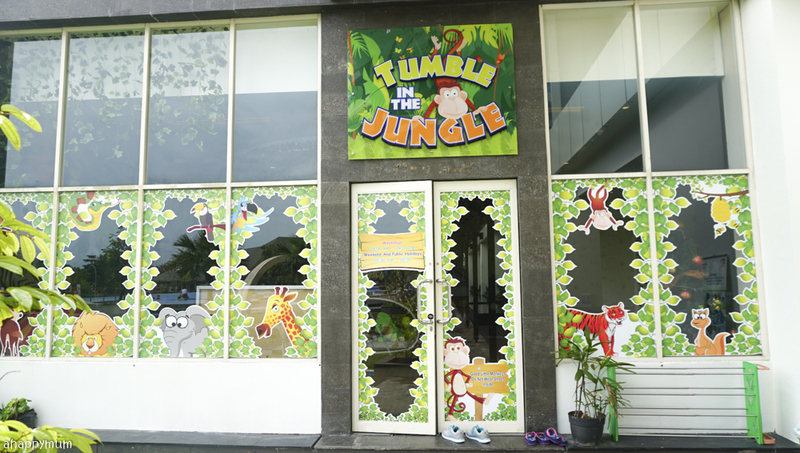 And of course not forgetting all kids favorite the Kids Club "Tumble in the Jungle" no kids can resist!! 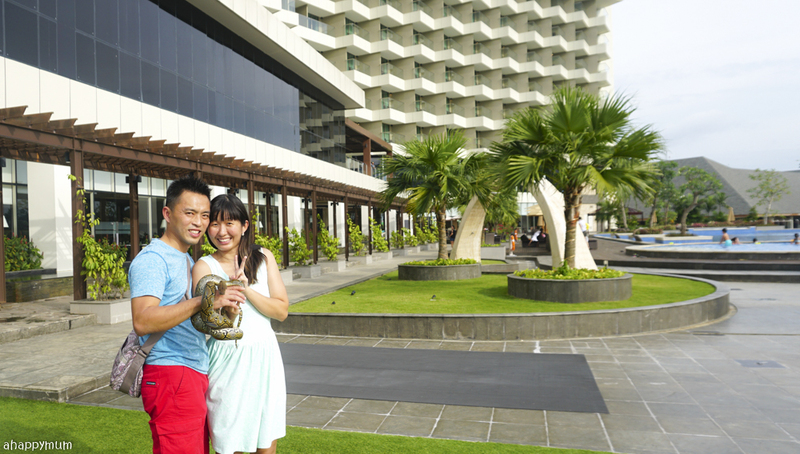 Thanks for your very detailed sharing on Raddison Golf and Convention Batam as well as for organizing this giveaway. Our family is looking forward to trying out all the activities there. 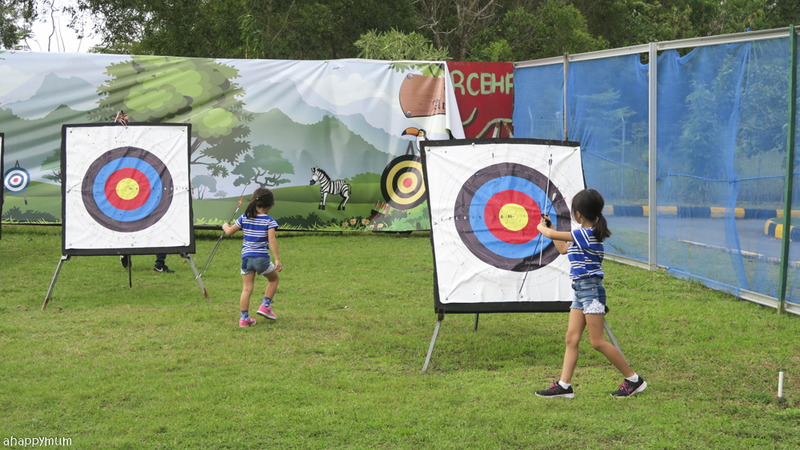 There are so many great options like "Tumble in the Jungle" kids club, the new Zoysia Spa, great food at Bite Restaurant, archery, swimming, golf...we are so looking forward to the opportunity for family bonding trip there and a much needed short break for everyone in the family. I really wish to be the lucky one chosen. We will look forward to the "Tumble in the Jungle" Kids Club at Radisson Batam cos my son is a big fan of jungle animals now especially gorillas, elephants, lions and monkeys right now and we as parents can have a peace of mind that he will be self sufficient in this playroom and the resort is a perfect one stop shop for everything under the sun that we need, from food to activities for a fantastic family vacation. Tell me what you look forward to most in Radisson: My family of four have never been on an overseas trip since our eldest son has been born. 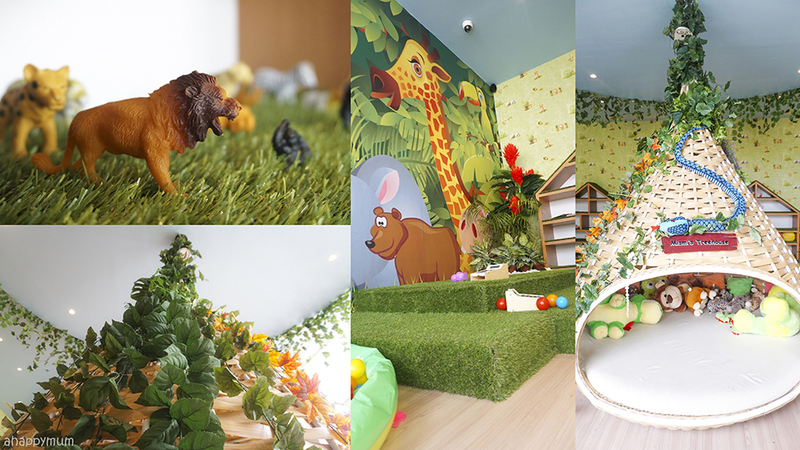 My 2 boys like animals and we definitely look forward to exploring Kids Club and observing the wild reptiles in their habitat. Most certainly we adults will also get to enjoy and look after our kids and have family fun!! My husband and i are food lovers. We are so looking forward of their buffet breakfast and dinner. We would also like to experience having breakfast beside the pool while our son bask in the sun. It would be so much fun. 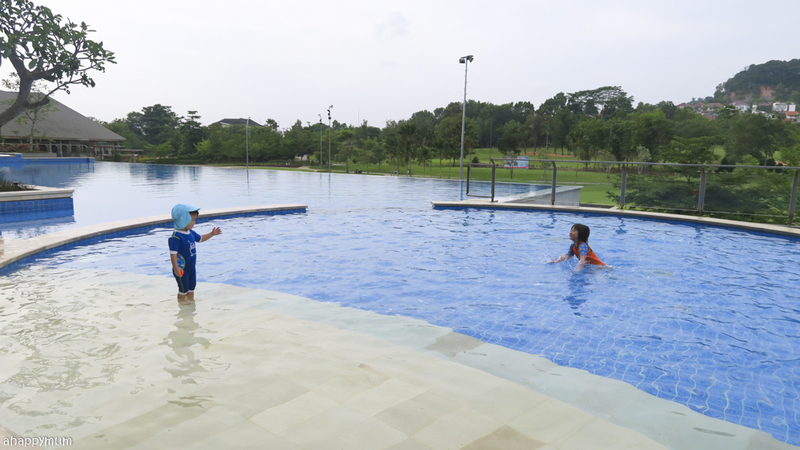 And definitely, my son would love and enjoy himself in the kids club while the hubby and i can have a couple time in zoysia spa. Looking forward to stay to this awesome family friendly hotel and activities. Thank you for this giveaway. N such a detailed review, definitely looking forward to stay at Radisson with my family. My 8 year old will be trilled to meet the reptiles. I look forward to bringing the girls to Kids Club as I am sure they would be having so much fun time there and truely enjoy themselves. Most importantly, is to see a smile on their faces ar the end of the day. 1.The Executive suite and a connecting Deluxe room for the kids. It's ideal for the couple's privacy, yet not neglecting the children.The rooms are equipped with LED 40" TV, rain shower shower cubicle, bath tub, mini bar, WiFi, bar counter and refrigerator. This is impressive! 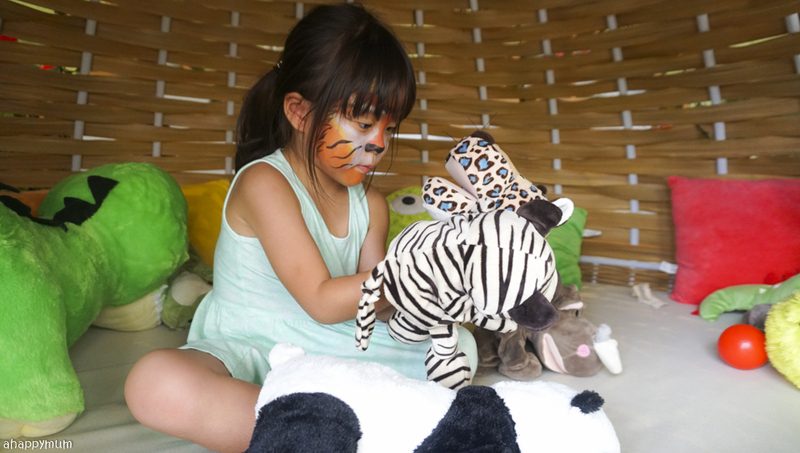 2.My kids would be overjoyed with the Tumble with the Jungle and Meet the Animal session as they simply love animals and the nature. 3. My hubby and I would love the food and the new Zoysius Spa most. Thanks again for the wonderful giveaway! I look forward to the archery the most! Have been telling my wife and kids to try for golfing and archery together and this is a great chance for us to have a family vacation! Thank you for giving us a chance to experience this amazing vacation! I look forward to interacting with exotic animals the most! Aside from staying in what I'd call a luxurious home-away-from-home, it excites me that Radisson are so proactive with wildlife conservation and that they home these pets that aren't ever allowed in Singapore! It would be a great experience to get up close and personal with such interesting animals :) Hope to win!